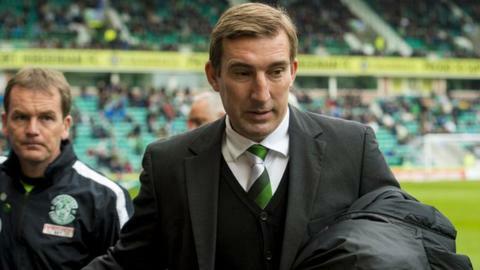 Hibernian head coach Alan Stubbs believes his team can cope with the physical onslaught of the Premiership play-off semi-final. Hibs defeated Raith Rovers 2-1 on aggregate on Saturday and now face Falkirk on Tuesday in the first leg as they vie to face Kilmarnock. "My team certainly don't look tired," he told BBC Scotland. "With the energy and effort they put in today, they're a team that's in good form." Goals in the first 12 minutes from John McGinn and Darren McGregor negated Rovers' 1-0 lead from Wednesday's first leg, the quick-fire start delighting Stubbs. "It's always good when you do start the game as bright as we did - you manage to score when you're on top," he said. "When you've got hold of an advantage, there's bound to be times where you're going to be a little bit edgy, but the most important thing is we've come through another high-pressure game. "We didn't look imbalanced. The opposition, if anything, did because they had a centre-half playing centre-forward, two centre-halves in midfield. "We knew we were going to have to deal with an aerial threat and, in the end, they were more hopeful balls into the box. "There's a lot of character in the team, a lot of belief, and we move on." Kilmarnock await the winners of meeting of the sides who finished second and third in the Championship after their home defeat by Partick Thistle ensured that the Ayrshire side would finish second bottom of the Premiership. Raith Rovers manager Ray McKinnon, meanwhile, hailed his player's graft and determination as the fourth-top side missed out on the next stage. "We're really disappointed we're not involved after the season we've had," he said. "But that performance in the second half typifies our whole campaign. That attitude, that commitment, that determination to be competitive. "The guys can walk away today with their heads held high." McKinnon also reiterated that he was fully-focused on matters in Kirkcaldy, despite intense speculation linking him to the vacant manager's role at Dundee United. "As it stands, I'm the Raith Rovers manager," he said. "Nothing changes, it's just all speculation. "I'll go away tonight and reflect on the game and see where we are moving forward for next season."